The day Robert E. Lee surrendered to Ulysses S. Grant in the parlor of Wilmer McLean's house in Appomattox Court House, Virginia, the two generals fired the first shots of a second, albeit different war: a war for the meaning of that iconic event and how it would be remembered. Grant opened the battle with the magnanimous surrender terms he offered to the Army of Northern Virginia. Lee countered with General Order No. 9, his melancholy farewell to the men he led for four agonizing years. Each man understood his document in ways consistent with the ideology for which he had fought. The political, social, and cultural debates these documents spawned in the months after the surrender are the subject of Elizabeth Varon's provocative and insightful study of an event most students of the Civil War thought they understood. Varon probes deep into the psyches of Lee and Grant and analyzes them with fresh eyes to understand what kind of nation they envisioned emerging from the wreckage of war. Grant's surrender terms reflected a victor's generosity and spoke to the moral righteousness of the Union cause that promised a better future for all citizens of an improved, united nation. Lee's unrepentant message looked to the past and lamented the loss of an idyllic, simpler time when the virtue, privilege, and honor of the white South prevailed, before it was ground down by the weight of the North's gross numbers and impersonal industrial might. Varon contends that both Grant and Lee were men of peace on April 9, but peace of very different kinds. The two men thus become touchstones for Americans struggling to understand how the war would affect their daily lives. Grant's surrender terms and Lee's farewell order became the founding documents for 150 years of debate over the legacy of the Civil War. Varon also delves into the letters, diaries, and memoirs left by the men of the two armies who fought each other during those last desperate days. "The Union and Confederate soldiers who fought the Appomattox campaign were keenly aware," she concludes, "of the political nature of the surrender and of the high stakes involved in interpreting it." While the opinions of individual soldiers varied, most of them adhered closely to the interpretations enunciated by their leaders. These feelings traveled with the soldiers as they returned home, forming the basis of Lost Cause mythology in the South and Reconciliationist vindication in the North. 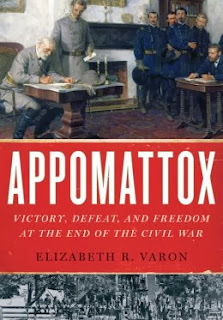 Varon gives appropriate credit for the important, but often unreported, role played by United States Colored Troops (USCT) during the Appomattox campaign. "In the eyes of black troops," she maintains, "the fate of the Union was still uncertain on April 9, 1865, and their own agency tipped the scales." Varon emphasizes that, for them, the end of the war was much more than a military victory that preserved the Union. They viewed their participation as an integral part of a victorious crusade that "incorporated the themes of not only racial pride and liberation but also of clemency: they attempted to inscribe a civil rights message into the magnanimous terms of the surrender." From the armies in the field, Varon gracefully moves to the two home fronts. In the North, the mood of the populace quickly shifted from joy and relief to shock and anger in the wake of Lincoln's assassination, occurring less than a week after Appomattox. Analyzing Radical, moderate Republican and Democrat, and Copperhead newspapers, Varon follows the panoply of public opinion toward the South in general and the Confederate government in particular. It ranged from mercy grounded in moral righteousness to retribution fired by grief and all the various shades of each in between. But through the cacophony of voices, the conciliatory words of Lincoln's last public speech and the magnanimous words of Grant's surrender terms reverberated throughout the North. Varon also recognizes that these sentiments were mirrored in the restraint shown by African American troops toward the homeward bound Confederate soldiers they encountered. Rather than responding with anger and violence in the wake of the president's assassination, she notes that "They paid tribute to Lincoln, as most white soldiers did, by upholding the fragile peace." Except for an almost universal reverence of Lee, feelings in the South were also divided about what the end of the war meant. The theme of General Order No. 9 -- that the South succumbed only to the North's crushing numerical superiority and massive material advantages -- helped many salve feelings of shock, disbelief, and humiliation that the vaunted Army of Northern Virginia could be surrendered. Again, Varon uses newspapers to take the pulse of public opinion. It ranged from resignation and a wish for "peace and brotherhood" to angry defiance, urging "more determined and united action." Southern Unionists felt vindicated in their loyalty to the old flag and Southern blacks "celebrated Lee's surrender as a day of jubilee." The battle over the meaning of Appomattox, Varon astutely concludes, "did not simply pit South against North or even Confederacy against Union. Instead it pitted those who opposed a thoroughgoing transformation of the South…against those who demanded such a transformation." The ideological battles of a second Civil War, less bloody, to be sure, but just as determined, had begun. In an earlier book, Varon expertly chronicled the turbulent decades leading to national disunion. She now reveals an equal affinity for documenting the dramatic ending of that disunion. Her scholarship provides readers with excellent bookends for the many volumes devoted to the Civil War. At its root, Appomattox is a study of the power and subtlety of language. In her clear, confident, yet elegant, prose, Varon gives renewed life to many of the players in the last act of America's greatest tragedy. We can hear and understand their points-of-view, even if we don't agree with them.